Second, it is worth pointing out that LSU’s internal audit of Senator Cassidy did not address- at all- the fact that he submitted timesheets indicating that- on nearly two dozen occasions- he worked in Baton Rouge on the same days he cast votes and attended committee meetings in Washington, D.C. and that in most of those instances, it would have been physically impossible for the then-Congressman to have done so. That was the substance of my reporting, which relied entirely on the public record, and it has never been disputed or proven false. LSU’s internal audit is- in my opinion- problematic for a number of reasons, but it did not, in any way, suggest that I made any false or erroneous claims. In fact, it actually confirmed the bulk of my reporting (and Jason Berry’s as well): Cassidy did not have a written agreement, and both he and his supervisors failed to adequately and appropriately document his work. The audit did assert that Cassidy brought value to LSU (and that assertion was based on the testimony of colleagues), but that if they were to continue their professional relationship with the Senator, they would need to make immediate changes to ensure everything was above board. That’s exactly what my reporting demanded– accountability and transparency– and ultimately, LSU was forced to acknowledge that Cassidy’s arrangement needed to be formalized and his work needed to be properly documented. Third, as Mr. Fuselier points out, the suggestion that Steve Scalise was merely at a neighborhood meeting has been thoroughly and repeatedly debunked. I understand you fashion yourself as an expert in Louisiana politics. I recommend that you read Tyler Bridges’ book “The Rise of David Duke.” In his book, you will learn about Kenny Knight, a white nationalist who served as Duke’s campaign manager for several years and is now an integral part of his organization. The initial reporting that Scalise had actually been at a neighborhood association meeting was done by a freelance journalist at Slate and a reporter with The Times-Picayune. Both of their reports were based entirely on conversations they had with Kenny Knight, and since then, state and national news organizations have reported extensively on Knight’s claims. a) Kenny Knight claimed that he left with Scalse at the conclusion of the “neighborhood association” meeting, which he says was 2.5 hours before the EURO conference. He also claimed that he did not return for the EURO conference. 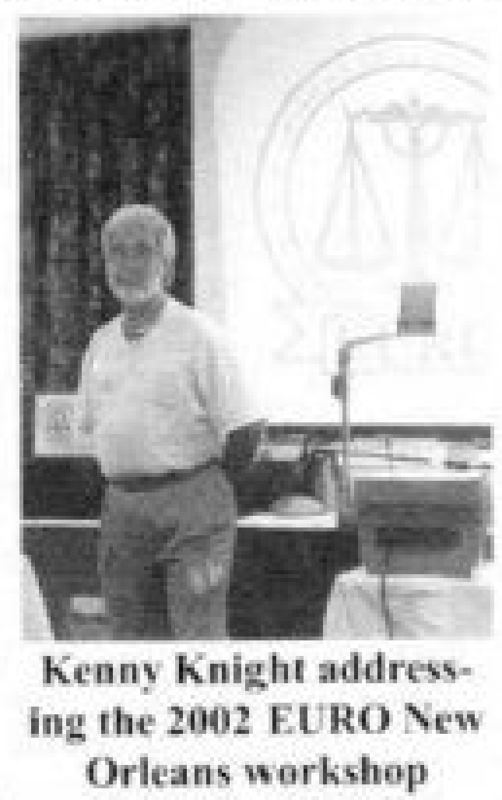 There is irrefutable photographic evidence that Knight is lying: A picture of Knight addressing that exact conference in David Duke’s June 2002 newsletter. b) The Jefferson Heights Civic Association- the organization Knight claimed that Scalise had addressed- does not and has never existed, neither formally or informally. It has never been registered with the Louisiana Secretary of State; it had never been named or discussed online or by any news source, and residents of Jefferson Heights actually belonged to another organization, which ousted Knight as a member when he began publicly and falsely claiming to be its president during a run for parish council. c) As Bridges points out in his book, it was not unusual for Duke’s organization and other neo-Nazi and white supremacists groups to use phony names in order to secure hotel conference rooms. I am not sure that is what happened in this instance, but it’s worth noting that Best Western corporate actually issued a public statement denouncing the group after learning it was hosting a conference in its hotel. The Iowa Cubs- a minor league feeder team for the Chicago Cubs- canceled its rooms when it learned of the conference. There were also published reports at the time about the police being concerned about protests and security. In your haste to libel me and disparage my integrity and honesty as a reporter, you have decided to take the blatantly false and thoroughly debunked testimony of an avowed white supremacist over an enormous body of evidence and the word of the Congressman himself. Less than 24 hours after I broke this story, Congressman Scalise publicly acknowledged its veracity and issued a statement of regret. My reporting on Congressman Scalise was completely accurate. 4) I am not and have never been a spokesperson, official or otherwise, for the Louisiana Democratic Party. I’ve never worked or volunteered for the Louisiana Democratic Party. I’ve never even been to their offices. Furthermore, I’ve never worked as a paid campaign consultant or aide. Yes, I’ve volunteered for candidates. I’ve contributed financially to campaigns. I’ve spoken out publicly in favor of candidates I believe in. The implication, however, that I am colluding with or somehow working for the Louisiana Democratic Party is absolutely false. You and I may not share the same politics, but I appreciate your passion for Louisiana. 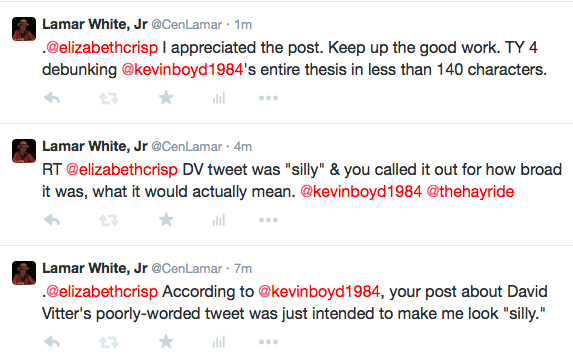 I do not have any issue with being corrected or “called out” when I am wrong. I’ve been at this for nine years, and on a couple of occasions, I’ve had to retract and even apologize. Because I’ve learned that if you want people to trust you, it’s critical to admit when you’ve made a mistake. This post isn’t breaking any news. This is not reporting a real story, and this isn’t merely an opinion piece either. This is just about smearing me. And it’d be one thing if you were criticizing me for getting the facts wrong, but instead, you are actually, repeatedly lying, whether intentionally or unintentionally, about the facts. It’s a reckless hit piece, and again, I request a retraction. I don’t expect or request an apology, because apologies are only valuable if they’re genuine. Just a retraction. That you are correct is certain, but, in my opinion, trying to engage such faux bloggers is like playing chess with pigeons. They ignore the facts, make up their own rules, knock over the pieces, cr*p all over the board, and then strut around like they’ve won. Solid investigative journalism such as you provide is invaluable and a lot of Louisianians appreciate your writing. Thank you!